As a kid I never paid attention to fences. Ever. Well I take that back, I did pay attention to some regard. My parents had a really big pie shaped lot and had 4 neighbours that they shared a fence with behind them. I always walked or took the bus home from school. But if I hopped the fence of the one neighbour behind us, it saved me a 15 min walk. He never liked it though and would always yell at me if he saw. So that is the extent of my fence experience. What I now know as a adult is that fences are bloody expensive. You wouldn't think so, just being wood and all. 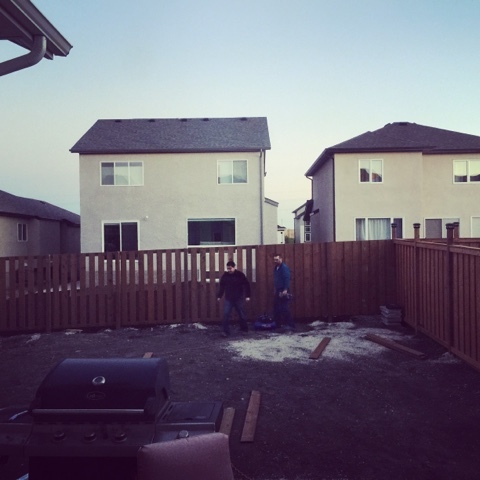 Between paying for a guy to come out and drill holes/install posts and all the wood (Brad did the rest of the work), it was about $2000 to get the fence in. We have been in the house a year and it's nice to finally have the fence up. Next is getting the deck, sod, hot tub and stone fire pit. Hot tub might be next year though. Can't wait for our tiny oasis to be finished. In the pic below the fence is slanted. All the fences are that way to incorporate the grading slope. Kind of looks odd to me, but all of the fences on the entire street are built that way.